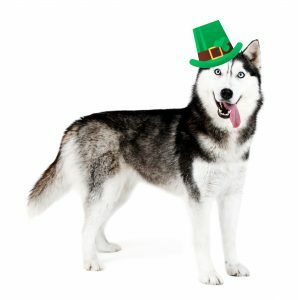 What is YOUR pet Care Need? Professional Pet Sitting etc may be able to help. Professional Pet Sitting Etc has been Solving Pet Care Needs since 1990! Professional Pet Sitting Etc was started when People were asking for help feeding their pets while they had a dinner engagement or letting the dogs out while they were at work for long days and more. As time went on, there were more reasons that people needed help with their pets. The great thing is Professional Pet Sitting Etc has been helping with a variety of reasons and we offer services 365 days a year!! Here are just some of the Pet Care needs that we have helped with. 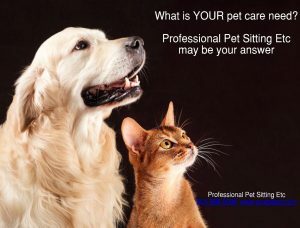 Did you know Professional Pet Sitting Etc has cared for many pets their entire lives? We have many dogs we have cared for from puppies at 8 weeks of age right through to 12, 14, 16 years of age. We love them as if they were our own. And we sure do miss them when they are gone. Did you know Professional Pet Sitting Etc has many elderly pets that we visit daily to get them out while their owners are at work? Elderly dogs will generally get into the habit of just sleeping all day long. Unfortunately, the inactivity is not good for them mentally or physically. It does these guys good to get them a break in the middle of the day, get those joints moving so they are less stiff, get them a bathroom break since they may not be able to hold it as long as they once did. Did you know Professional Pet Sitting Etc can just do ONE pet care visit when you may need it? We can come for a morning visit, mid day visit, supper visit or PM visit any day. You can book in just one visit, two, three or four per day. You do not need to use us alot, just when you may need help. However, if you do need us alot, we can help with that, too! Did you know that you also can book in how long you want the visit? We have up to 30, 60, 90 and 120 minute visits! Did you know Professional Pet Sitting Etc has many clients who travel extensively and also many clients who only travel every few years? We can help whenever you travel. Did you know Professional Pet Sitting Etc helps many Elderly and Disabled clients who are unable to care for their pets? 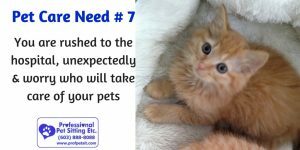 These amazing clients may not be able to get out and walk their dog or bend down to fill a water dish or scoop the litter box. We can help 365 days per year for any person who needs help due to physical limitations of any kind. Did you know Professional Pet Sitting Etc helps many clients who must go into the hospital for any reason. As soon as you know your dates, you can go online, book in your reservation, get our email confirmation and now you can relax and focus on getting healthy. Did you know Professional Pet Sitting Etc ENCOURAGES every person to set up a personalized pet care profile with us when you do NOT need pet care? We want everyone to answer all of our registration questions thoroughly on their personalized pet care profile. The more information you can tell us about your pets likes, dislikes, feeding and much more, the easier it is for us and your pets. However, it is also EASIER on you. Once your file is complete, if anything should happen, you only need to go online and make your reservation. Even if it is from the hospital. You can even designate a back up person know your username and password, so they can make your reservation in any event that you can not. 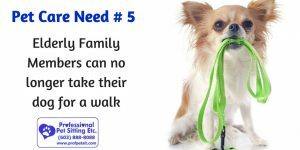 Did you know Professional Pet Sitting Etc receives many calls from new clients stating they have never needed pet care because they always had family to do it? Now everyone is going to a wedding, a reunion, or now their son or daughter is going to college….We are happy to help with pet care whenever you need us! Did you know Professional Pet Sitting Etc has been put on baby notice for many new parents to be? We sometimes know when babies are coming before other family members do!! Did you know Professional Pet Sitting Etc will help with pet care even if you are home? 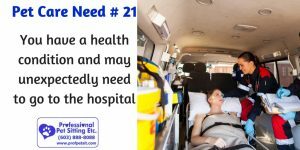 Many people do not think to call us for help if they are home. We will help with pet care whenever you need us, whether you are home or not. 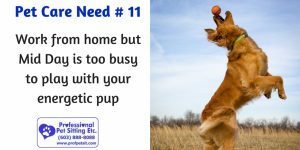 If you feel overwhelmed with a newborn and just need some help with your pet care, please call us. Did you know Professional Pet Sitting Etc has many clients who work from home? Your days are busy whether you work from home or not, but your dog has no idea why you are not paying attention to him. Dogs look forward to us coming every day to play, get in a walk, fresh air, play ball and get in a much needed potty break. Best thing is after we leave, they go and lay down, giving you peace and quiet for the rest of the day! Did you know Professional Pet Sitting Etc will come and scoop your litter boxes for you? Yes, we can take that chore off your to do list. The other plus is that a clean litter box is the number ONE prevention to keep cats from going else where. 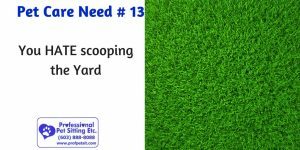 Did you know that Professional Pet Sitting Etc will come and scoop your yard for you? Yes, we can take another chore off your to do list. Did you know Professional Pet Sitting Etc has a service called Feline Fun Time? This is a service just for cats whose owners are at work during the day. We can come in everyday, just like our dog walking visits but this is for cats to play inside, get snuggles, treats and help to burn off some energy. This is great for kittens but also for older cats. 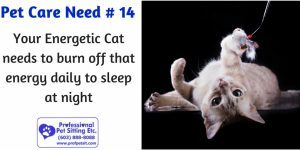 As cats get older they slow down and we need to get them moving which helps their joints become less stiff. Cats are so good at not letting us see they are in pain or stiff and most owners do not even know. As for the younger cats, this service is amazing. It gets those kittens playing and running and hopefully tired enough so they are not keeping you up at night. Did you know Professional Pet Sitting Etc has gone to many facilities to help owners with their pet care? If your Mom or Dad is fortunate to be able to bring their pets with them, we can help. Facilities do not help care for any pets, just your parents and in many cases, your parent may not be able to walk the dog or scoop litter boxes. 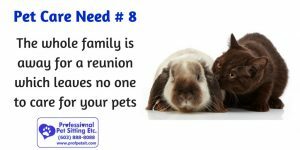 It is SOOOO important for pet owners to not be separated from their pets as they grow older. It is a very strong bond that should not be broken. Did you know Professional Pet Sitting Etc can help with diabetic pets? We have helped with quite a few. 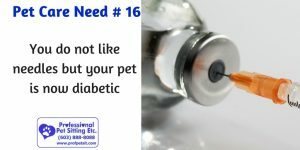 If your pet ever becomes diabetic or needs medications, we can help. 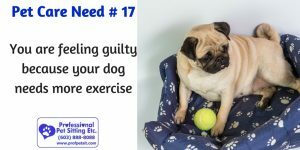 Did you know Professional Pet Sitting Etc can get your pet on an exercise routine? We can come in on a daily basis or 2-5 times per week while you are at work and get them playing and moving. A nice walk around the block will help burn off the extra pounds along with cutting down on feeding. We can tell you how much. Having a trimmer pet helps to increase their health which may increase their life expectancy. We all want our pets to live forever. 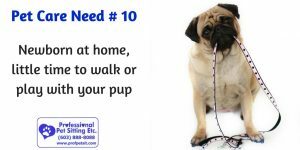 Did you know that any time you bring your pet to stay in a place other then home without you, your pet is stressed? If there is just one pet that is stressed and crying, then ALL pets around them will be stressed for the entire time. 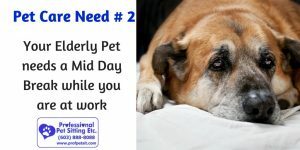 Many owners bring their pets home to find they sleep and sleep and sleep thinking their pets had a grand time playing when in actuality, now they are home they can relax and sleep since they have been up for the past few days stressing. And that is just the dogs, cats will not show it, but they never do well outside their home. Leave them home, where they are comfortable, and less stressed. They will be a bit worried because you are gone, but will be much happier in their own surroundings. Did you know Professional Pet Sitting Etc in some areas, can have a sitter stay in your home overnight? Yes, they can sleep with your pets in bed, if it is allowed!! 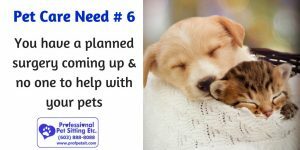 Did you know Professional Pet Sitting Etc can be your Plan B? Again we ENCOURAGE everyone to register with us and complete your personalized pet care profile when you do NOT need pet care. So you will be ready when you do! 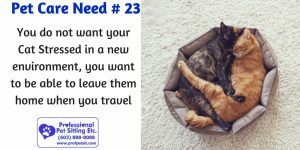 We have many people who call us in a panic because their friend, neighbor, relative or whoever had promised to care for their pets and now can not do so and they are leaving on vacation……If they are a registered client, all they need to do is put in a reservation. If they aren’t, we try to help but we may not be able to. We have also had calls where a family is in Florida and the person caring for their pets at home is sick or has a family emergency and can no longer help. Again, if they are registered, they just need to go online and make a reservation. 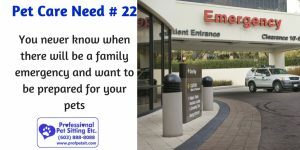 Did you know Professional Pet Sitting Etc will help you with pet care if you are rushed to the hospital? If you are a registered client with a completed file, we will always help you. Did you know Professional Pet Sitting Etc will help you with pet care if you have a family emergency? Did you know that 55% of all the pets Professional Pet Sitting Etc cares for are cats? That is thousands in a year! Cats are very sensitive and do not like too much change. Just having their owners gone is stressful. Changing their environment is off the chart. Cats do amazingly well just staying at home. We love cats, alot! Did you know Professional Pet Sitting Etc cares for many pets besides cats and dogs? 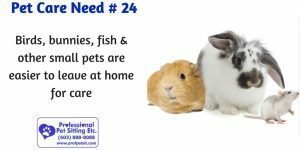 We have cared for rabbits, guinea pigs, fish, mice, hamsters, iguanas, koi ponds, chickens, llamas, goats, and much more! Did you know Professional Pet Sitting Etc has many clients book a supper visit only once in a while? You do not need a lot of pet care for us to help you. You may only need one visit every few months or you may decide that we are so convenient that you book in a lot…yes, that happens!! Did you know Professional Pet Sitting Etc helps clients who do day trips? Many clients go skiing, sight seeing or just a nice drive for the day and book us in for a visit. Did you know Professional Pet Sitting Etc can help with pet care for however long you are away from home? The longest someone was away was 6 months!! 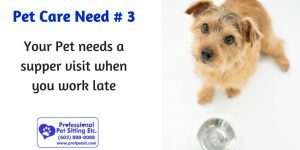 We can come in 4 times during the day, have a pet sitter stay overnight or whatever you decide. You can make your reservation however you want and as long as we can fit you in the schedule, we will confirm and you can go have fun all around the word and not worry about pet care. 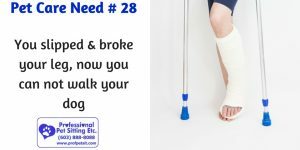 Did you know Professional Pet Sitting Etc helps many clients who have broken a bone? We have helped people with broken legs, broken arms and a person who broke both arms and a leg!! 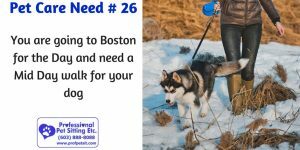 We can come in and help walk the dog, feed the animals, scoop litter boxes, etc. 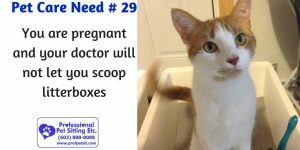 Did you know Professional Pet Sitting Etc gets many calls from frantic pregnant Moms, because their doctors have told them to NOT clean litter boxes or worse to get rid of their cat because of toxoplasmosis? Well, the first thing we do is calm down Mom because toxo is not that easy to get. In fact, toxo can be contracted from any raw meat or gardening but the doctor did not say do not eat any more meat. The best thing is to do a ton of research, to learn more. 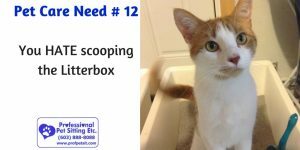 However, we can certainly help with scooping the litter boxes to take any possibility away. As for handling meat for dinner, you may want to speak with your husband, maybe he can cook for a while. 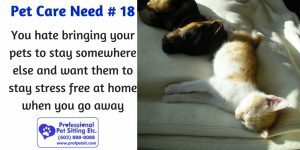 Did you know Professional Pet Sitting Etc thinks THIS is the BEST reason to use us for pet care? There is absolutely nothing better then to come home at any time of day or night and be greeted by your pet. The absolute best reason to come home!! 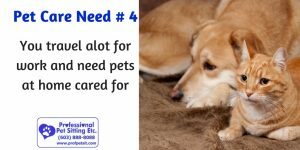 What is YOUR pet care need? Was it one that we listed above? Was it multiple needs above? 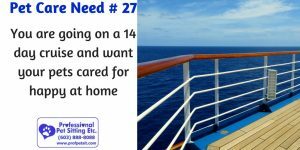 Is your pet care need one not listed? We would love to know your need. Maybe we can help. We want to know.